A while back I mentioned that occasionally I would share a photo from the past...and a little bit about that time. My thought is that if you get to know me a little better - how photography has always played some role in my life - that you will understand my passion behind my drive. 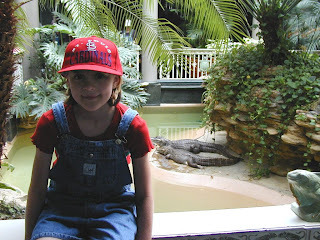 This is a photo of my daughter - she was 6 or 7 in this photo, and we were at the St Louis Zoo. Great place - it's absolutely gorgeous. She is one of my bright lights in this world. My daughter is the youngest of my kids, and even before she was born I had no doubt that she had a strong personality. It was against all odds that she is even here...and not a day goes by (yes, even the tough ones!) that I give thanks for her. I cannot imagine my life without her! Sadly, though, she does not like having her picture taken. Most of the photos I have of her in the last couple of years are either the ones taken by surprise, or her hand is somewhere in front of her face. (I do understand that feeling - because I cannot stand to be on that side of the camera lens myself.) But she is just so beautiful - and so photogenic.